This is an astonishing and extraordinary cats-eye tourmaline, 3.5 oz and 2” by 1.5” by 1.3” and is a new arrival from Brazil. And I am in love! Pictures do not do her justice – she is chatoyant and unless the light catches her chatoyancy, you think she is merely a dark green tourmaline. But with that light, her rich colors come alive and show pink, green and a touch of yellow! 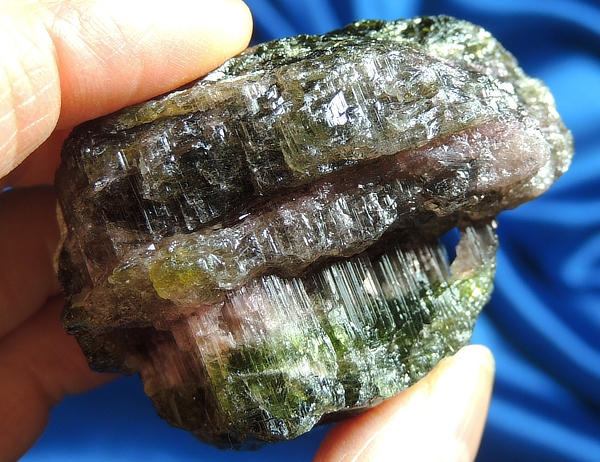 Her base contact area is healed while her termination and sides are terminated in such a manner that they resemble city blocks … she almost resembles a tourmaline scepter! There is even a bridge crystal of pink tourmaline! As if that weren’t enough, she has a few areas of minute crystals of quartz! She nests easily in the palm of the hand and you will love her loving aspects! The energy within this Spirit is deep and allows you to face memories and events that you “buried” within long ago – and often these memories are very unpleasant which is why they are buried. They are not forgotten or gone and they will emerge in very different ways. Sometimes, it’s a news story or a similar event or a relative coming for a visit. Other times, it has a physical manifestation in the form of debilitating disease or psychological issue. The key issue here is that as well as you thought it was gone … it isn’t and sooner or later, you must deal with it, no matter how unpleasant. The risk is that if you don’t, this block will remain in your Chakras, lifetime after lifetime and the events will recreate until you delve into them and release the issue. All that said, this is a wonderful Spirit for assisting with just that, but her loving pink and green aspects lighten the load, allowing you to work in a more gentle and calming manner so that the release isn’t as abrupt or extreme. Issues rise and one by one, and play to your psyche so that you can finally resolve them. This isn’t an instantaneous process, but one that will take time, patience and plenty of loving assistance from your crystalline friend. She wants to help and together you can free the limitations on your own Spiritual growth!